*This refreshing design will curve its way into your hearth. 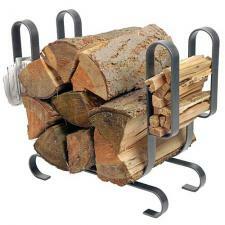 Handy too, with kindling and newspaper storage areas bracketing an abundant section for your logs. *Measures 32" Long x 11" Wide x 25" High. *Quality product made by Enclume in the USA - 25 lbs.